Bible of William J. Reed and Orianna A. (Jack) Reed, "Orie", of Harpswell, Maine, and Descendants. The Bible contains Family Records pages, several newspaper clippings and the calling card of their grandson, Carlton Burnham Morrill, dated 1898. Carlton R. Morrill and LaVerne E. Laughlin; married November 1, 1930. Carlton Reed Morrill was the son of Charles Burnham Morrill and Carrie Estelle (Reed) Morrill. Carrie Estelle Reed, born December 8, 1874; daughter of William J. Reed and Orianna A. (Jack) Reed, "Orie"
Ella Cornelia Reed, born March 27, 1877; daughter of William J. Reed and Orianna A. (Jack) Reed, "Orie"
George C. Moore, died February 5, 1934. George Comstock Moore was the husband of Ella Cornelia (Reed) Moore. Carrie E. Morrill, died March 24, 1936. Carrie Estelle (Reed) Morrill was the daughter of William J. Reed and Orianna A. (Jack) Reed, "Orie" and the wife of Charles Burnham Morrill. Orianna Reed, died April 8, 1943 - Orianna A. (Jack) Reed, "Orie"
Charles B. Morrill, died December 19, 1952. Charles Burnham Morrill was the widower of Carrie Estelle (Reed) Morrill, daughter of William J. Reed and Orianna A. (Jack) Reed, "Orie". The two entries on the page above are from the 1970s. extract in the Brunswick Record of an earlier article in the Brunswick Telegraph issue of March 24, 1871, indicating that William J. Reed went to San Francisco by rail in the company of others from the area. Death notice for Ora A. Reed, age 92. Funeral services at 2 p. m. Saturday from the Laws Funeral Home, 29 Federal Street, Brunswick. Interment in Riverside Cemetery, Brunswick. Death notice of Mrs. Barbara Coffin of East Harpswell; to be buried at Kennebunk in the spring. 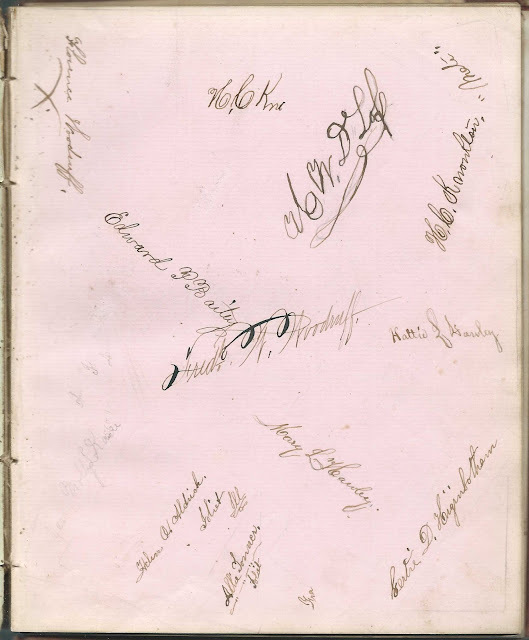 Autograph album started by owner Mary Jane Coryell, "Jennie", of Seneca Falls, New York, on October 19, 1861. The inscriptions date from the 1860s up to 1873. Inscribers were from New York, Illinois, Indiana, Michigan, Ohio and Wisconsin. Note on the ownership page, below, Jennie's birth and death dates, rendered in what appears to be a contemporary hand. A paper that appears to be a page from a smaller autograph album is tucked in the album. It contains inscriptions on each side, one of which was inscribed to Eliza in 1887 by Mrs. D. W. Edwards, possibly Mrs. David Wade Edwards. Jennie had died in 1879, and the album apparently passed into the hands of her younger sister Elizabeth Ann Coryell. 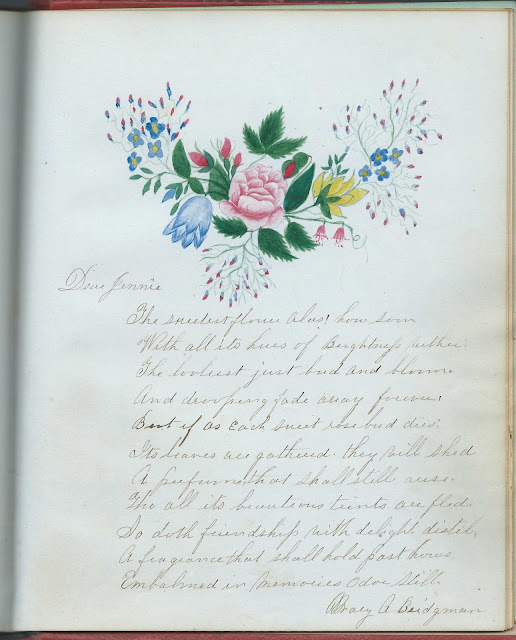 The album, published by Leavitt & Allen of New York, measures approximately 8-1/2" by 7" and contains inscriptions by Jennie's relatives, friends and schoolmates, many of whom inscribed other pages, including pages shared by multiple people. An alphabetical surname list and an alphabetical list of the inscribers, together with any personal information they offered, appear at the end of this post. 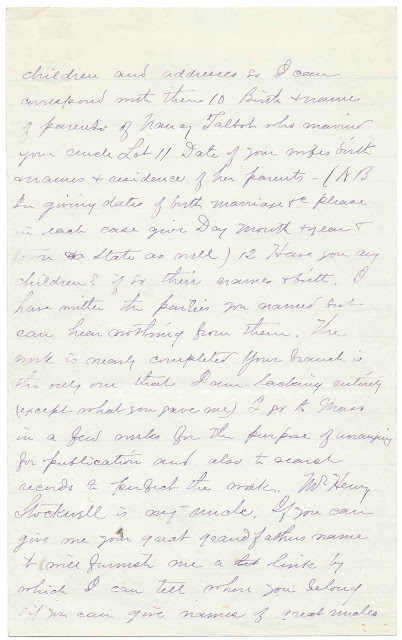 Mary Jane Coryell, "Jennie" was born August 9, 1839, the daughter of William Brundage Coryell and Lettice (Minor) Coryell. Jennie died, unmarried, on January 29, 1875. She buried in the Lake View Cemetery at Interlaken, New York, with other family members. Two of Jennie's sisters, Sarah and Eliza, inscribed pages, as did "Uncle John"; aunt P. J. Voorhees; and several cousins with the surnames Wyckoff and Voorhees; refer to the list of inscribers, farther below. 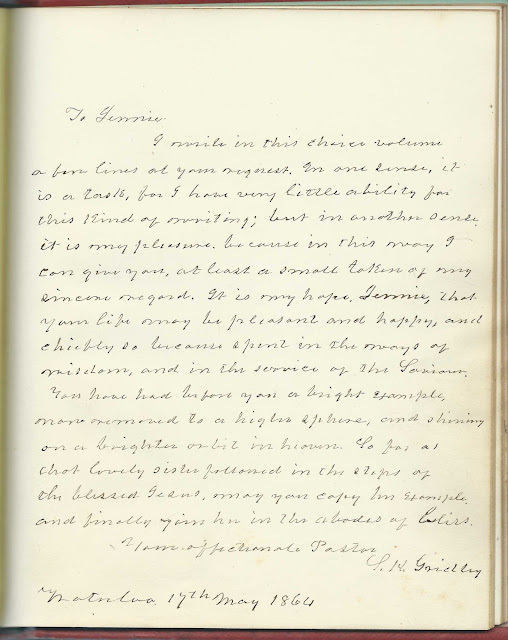 The S. H. Gridley of Waterloo, New York, or who inscribed his page there and described himself as Jennie's pastor, was presumably Samuel H. Gridley, D.D. One page has a beautiful spray of flowers, which might have been pre-printed, but I tend to think was done by the inscriber, Mary A. Bridgman. Lena or Sena or ? 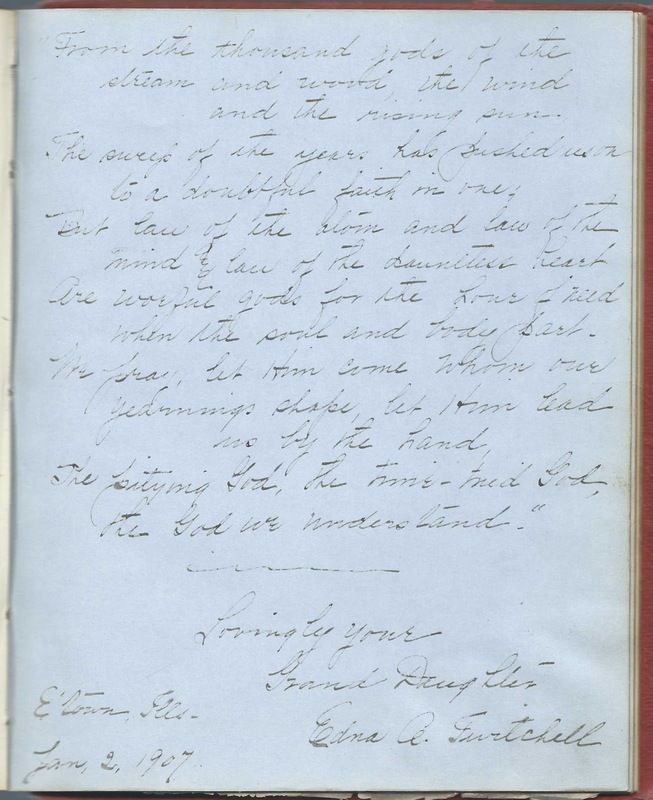 E. J. V.; two-page inscription of March 4, 1862. Not sure of middle initial. V. may stand for Voorhees. John J. Chapman; inscribed at Lodi, New York, on April 26, 1863; "A Friend of your Father and Mother"
Mrs. D. W. Edwards; inscribed to "Sister Eliza" at Seneca Falls, New York, on September 17, 1887. This is on a separate piece of paper tucked in the album and was inscribed after Jennie's death, when the album apparently passed to her younger sister Eliza. Mrs. D. W. Edwards may have been Sarah Edwards, wife of David Wade Edwards. John N. Greene of Champaign, Illinois; inscribed on August 24, 1865. Inscribed to "Sister Jennie"
S. H. Gridley; inscribed at Waterloo, New York, on May 17, 1864. Jennie's pastor Samuel H. Gridley, D.D. Mrs. A. C. Peterson of Farmer Village, New York. 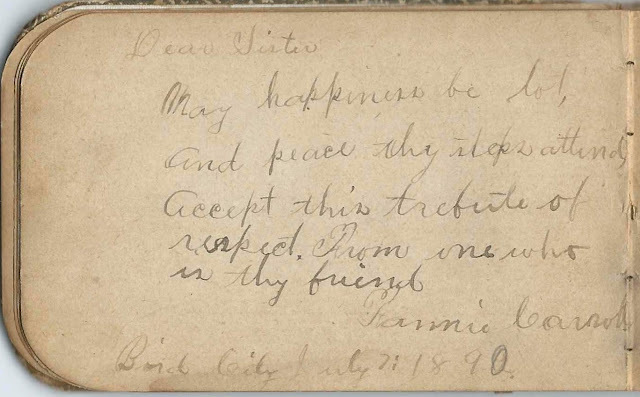 This inscription is on a piece of paper tucked in Jennie's album. The reverse has an inscription by Mrs. D. W. Edwards inscribed to Eliza, the younger sister of album owner Jennie Coryell, so this may also have been meant for Eliza. L. F. Woodruff of Romulus, New York; presumably Laura, as a paragraph in a similar hand was signed Laura. 1859-1861 autograph album kept by Josie Young who was presumably from the Joliet, Illinois, area, or a student in a school there. I'd be interested to hear what school in the area might have attracted students from out of state, as far away as Massachusetts. 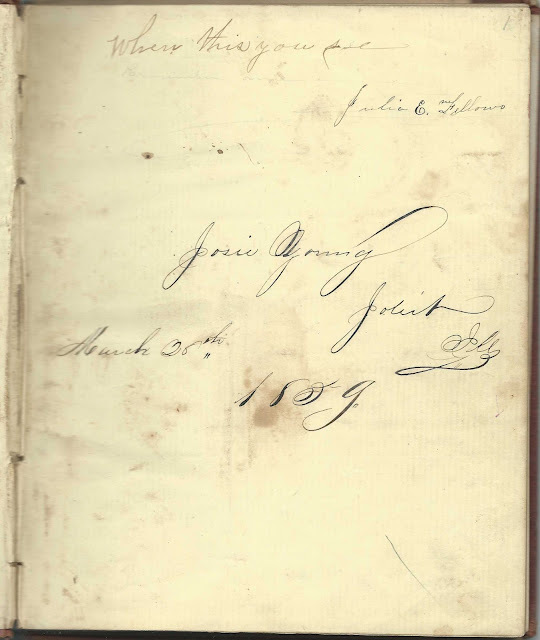 Josie herself inscribed one of the several shared pages on July 4, 1859, near the bottom edge of the page. 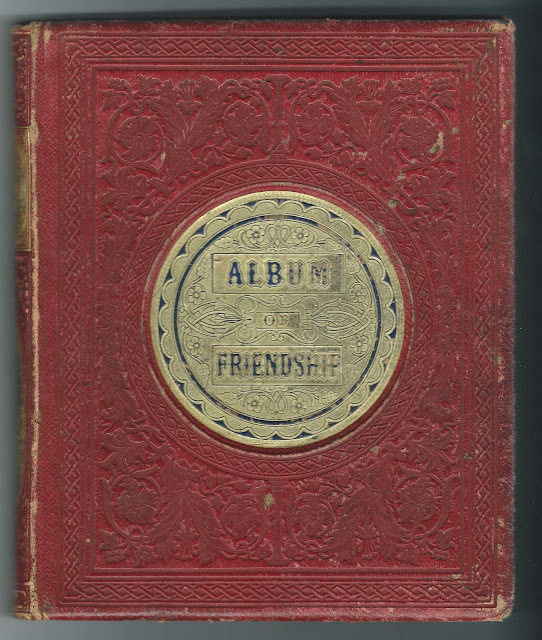 The album measures approximately 7-3/4" by 6-1/4" and contains the inscriptions of many of Josie's friends and presumed schoolmates, including at least one relative, cousin Lottie Cook. In case this is a clue, Lottie may have been Charlotte Cook, born about 1844, daughter of Matthias L. Cook and Flavilla (Seeley) Cook, who moved their family from New York or New Jersey to Joliet, Illinois. Many people inscribed more than one page and contributed to several pages shared by as many as 12 people. I believe Josie was born about 1844, the daughter of Daniel C. and Maria Cook, both natives of New York. This Josie married Hiram Fred Bush on January 18, 1865 in Illinois. By 1880, they had moved to Oakland, California. They had at least one child, a son Gavin Frederick Bush, born about 1865. If you have more information on Josie Young, please leave a comment or contact me directly. Perhaps a reader can help identify the person who inscribed two shared pages as ?. W. DeLofs or something similar. 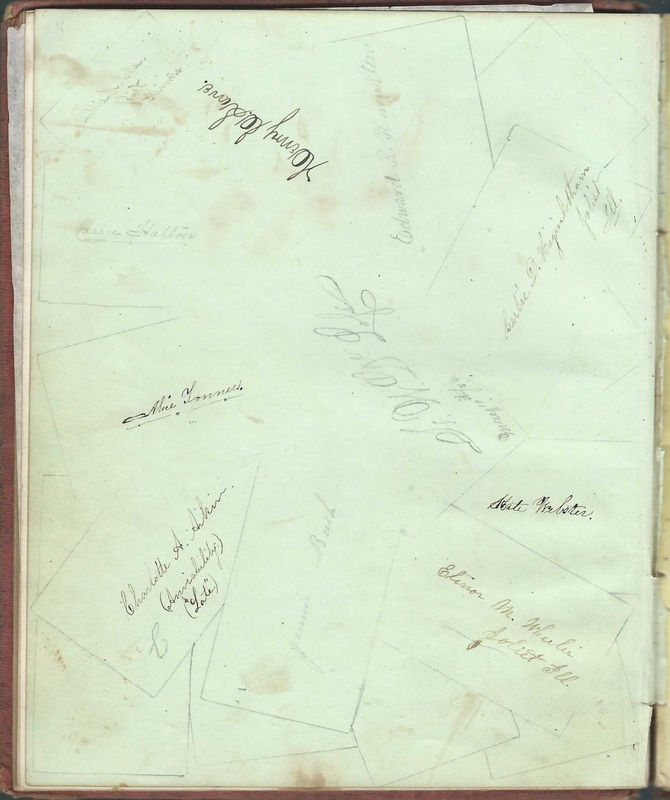 Inscribers in the Album - as you can see, many people inscribed more than one page. A. G. B. A.; inscribed on June 12, 1859. Added note: :Married Sept 1st 1861. Hattie Little". I found an Augustus Gridley Stanley Allis who married Harriet Newell Little in Will County, Illinois, on October 1, 1861. Josie got some of the dates in her notes wrong, but how to reconcile the difference in initials, unless he had a nickname that started with B? E. P. Bailey; inscribed at Joliet, Illinois, on April 27, 1859. Libbie Cole; inscribed at Joliet, Illinois, on February 14, 1860. 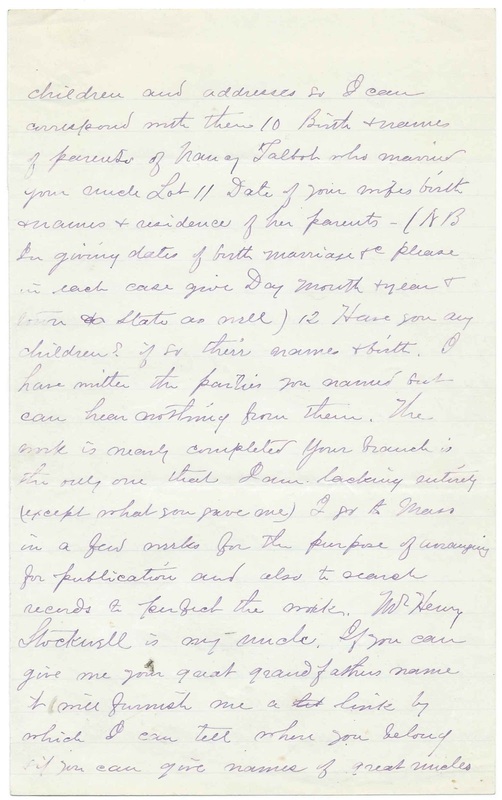 Added note: "Married, Mrs. H. Mosier". Shared the page with Lucy A. Munger. Julia E. Fellows - whether she gave the album to Josie or just happened to sign her name on the ownership page, I don't know. Julia E. Fellows of Joliet, Illinois; inscribed on a page shared by 10 others. William Grinton, Jr., inscribed on March 7, 1860. Gertie D. Higinbotham; inscribed at Joliet, Illinois, on May 16, 1859. 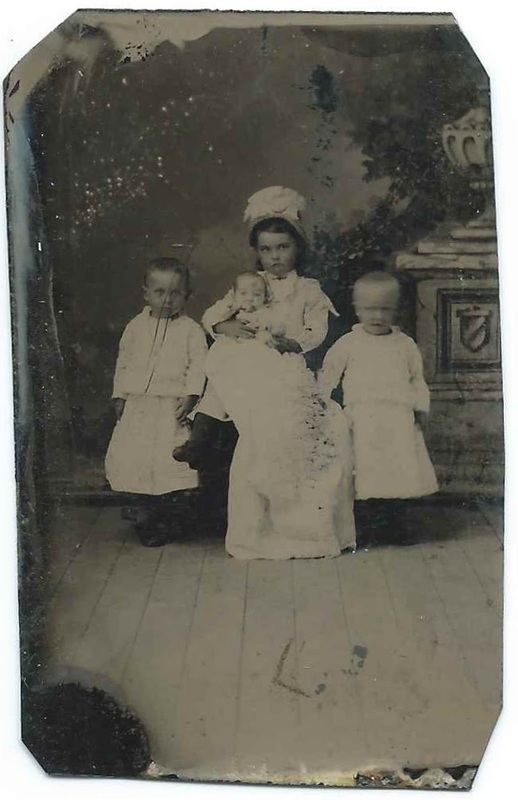 Gertie D. Higinbotham of Joliet, Illinois; inscribed on a page shared with 11 others. F. Jones; inscribed on May 10, 1859 at Joliet, Illinois; later note: "Married Sept 15th 1861, Mrs. O. H. Woodruff". Presumably Frances Jones , "Frankie", who married Orlan Hale Woodruff. Lucy A. Munger; inscribed at Joliet, Illinois, on February 14, 1860. Shared the page with Libbie Cole. Alice Tonner; inscribed at Joliet, Illinois, on September 4, 1859. Alice inscribed other pages as well. Alice Tonner; on a page shared with 10 others. Presumably the Allie Tonner who inscribed another shared page. Elinor M. Wheeler; inscribed at Joliet, Illinois, on May 13, 1859. 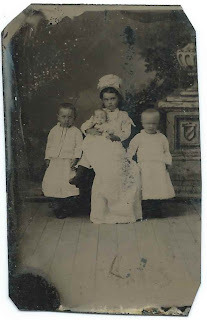 Elinor M. Wheeler of Joliet, Illinois; on a page shared with 10 others. Josie Young of Joliet, Illinois, inscribed on March 28th [not sure of last digit], 1859. Album owner. 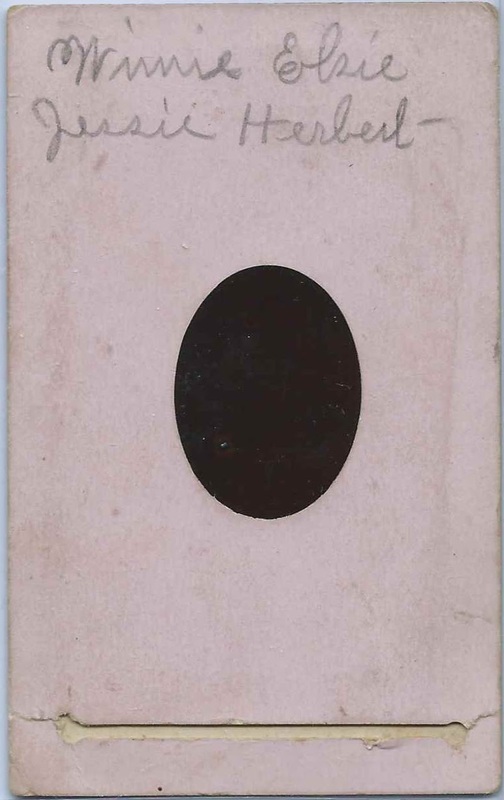 Autograph album that was presented by Renrut - presumably Turner - in 1854 to Miss Harriet Angeline Steele of Elizabethtown, Illinois. She went by Angeline or "Ange". 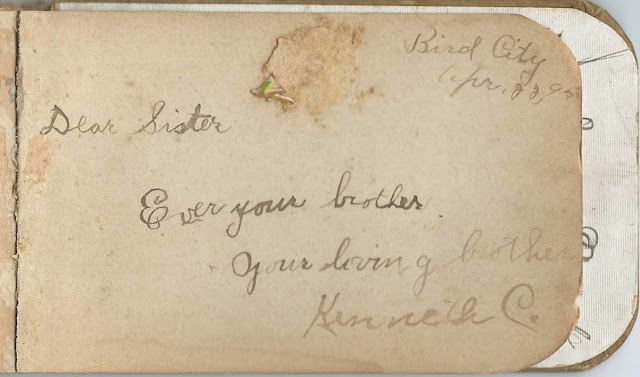 Most of the inscriptions are from the 1850s, with a few from the 1870s and several from the very early 1900s, including one by Ange's granddaughter Edna A. Twitchell, who inscribed her page at Elizabethtown, Illinois, on January 2, 1907. Edna was born December 25, 1883 in Colorado, daughter of attorney Lafayette Twitchell and Mary (Ledbetter) Twitchell. The album, printed by Moss and Brother of Philadelphia, measures approximately 8" by 6-1/4" and contains 6 engravings and the sentiments of over twenty of Ange's relatives and friends, some of whom inscribed in more than one place. An alphabetical surname list and an alphabetical list of the inscribers, together with any personal information they offered, appear at the end of this post. Also tucked in is the calling card of Mrs. L. F. Twitchell, who was the album owner Harriet Angeline (Steele) Twitchell, wife of Lafayette F. Twitchell. According to her Find-a-Grave memorial, which does not include a photograph of the stone with dates, and a newspaper clipping about her 50th anniversary, Harriet Angeline Steele was born June 1, 1836 in Hardin County, Illinois, and died on November 6, 1915 at Belleville, Illinois. Some unsourced references have her parents as James and Elizabeth Steele. Perhaps a reader will provide a link to birth and death records. About 1856, Angeline married Lafayette F. Twitchell, son of Moses Warren Twitchell and Lydia (Harris) Twitchell, who was born New Hampshire and Maine respectively. Lafayette was born in Elizabethtown, Illinois, in 1829 and died in 1908. The Find-a-Grave memorials for Angeline and Lafayette indicate that they had five children, four sons who survived to adulthood and a daughter who died young. 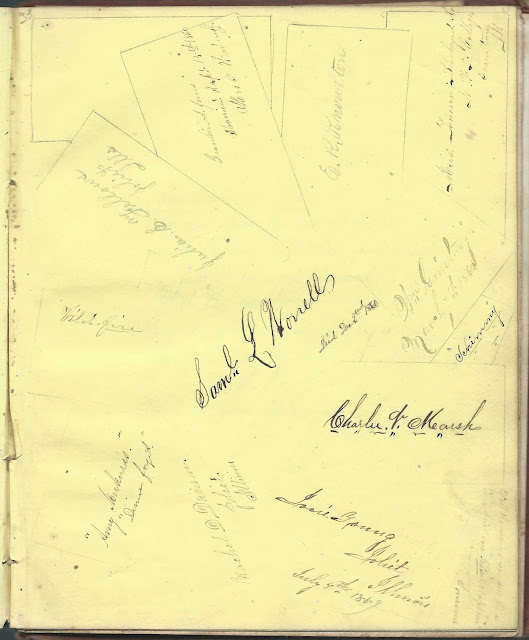 Three of their sons were doctors, the other a lawyer, Lafayette F. Twitchell of Denver, Colorado, who was the father of Edna A. Twitchell, who inscribed the page shown farther above. R. L.; inscribed a sentiment on a paper found tucked in the album. 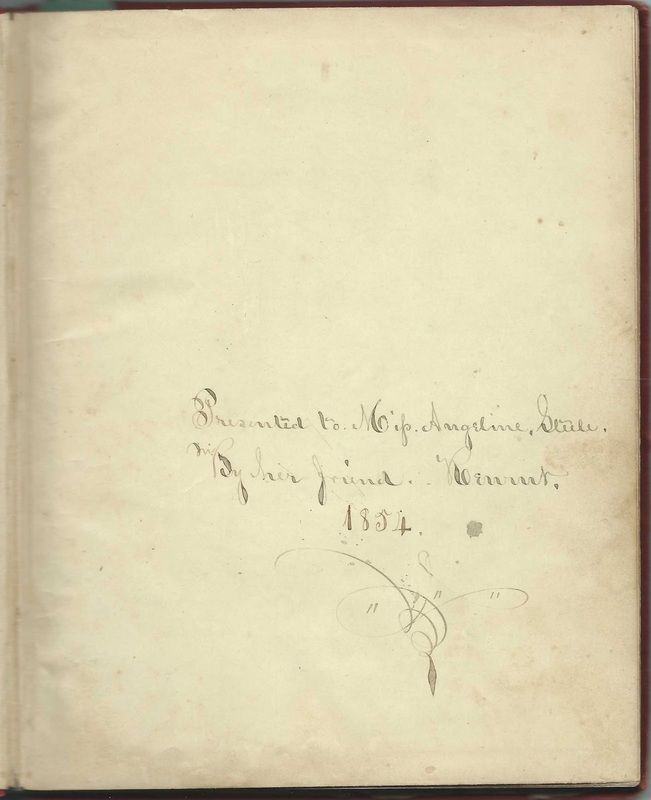 Also inscribed a page in August 1854. Possibly R. Latimer? Latimer; inscribed at H. C., Illinois, on August 20, 1854. H.C. may have meant Hardin County. 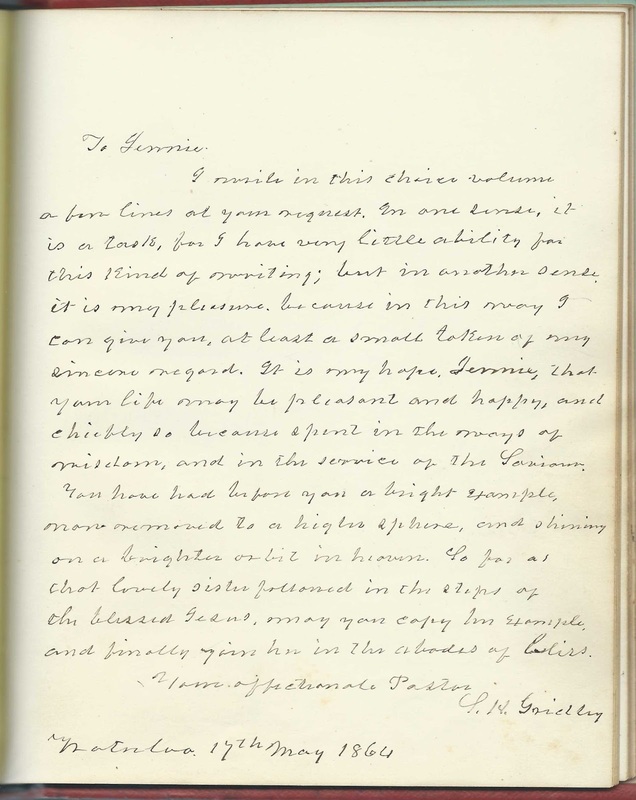 Latimer was presumably the Remital who inscribed a page at Chili, Illinois, on October 1854 and may have been the R. L., who inscribed two pages, one of them in August 1854. Grover C. Oxford, inscribed at Elizabethtown, Illinois, on December 30, 1906. Shared the page with Ben H. Gullett. Harriet Angeline Steele, "Angeline" or "Ange", album owner, from before and after her marriage to Lafayette F. Twitchell. "Presented to Miss Angeline Steele By her friend Renrut, 1854". Renrut is presumably Turner, spelled backwards. 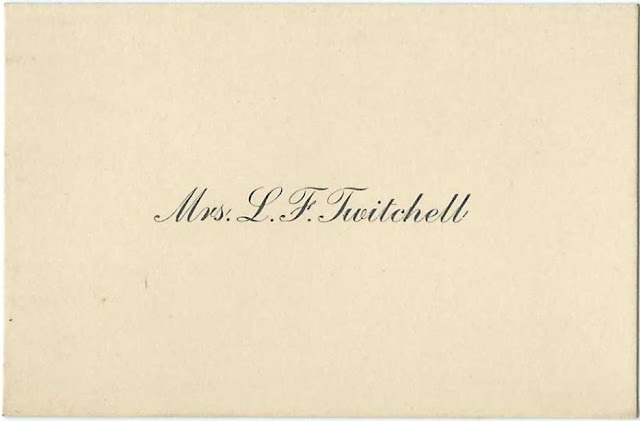 Tucked in the album - calling card of Mrs. L. F. Twitchell. 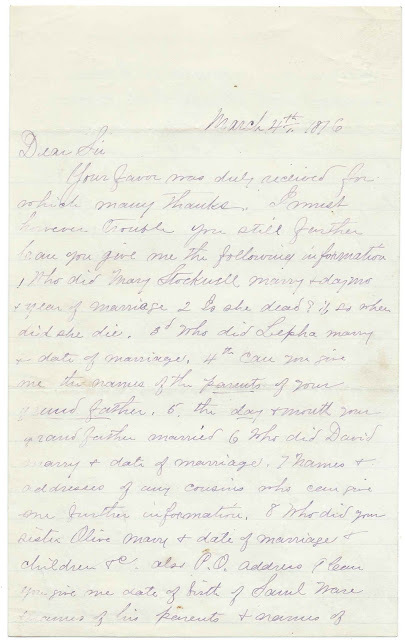 Angeline married Lafayette F. Twitchell about 1856. Renrut - presumably Turner, spelled backwards. 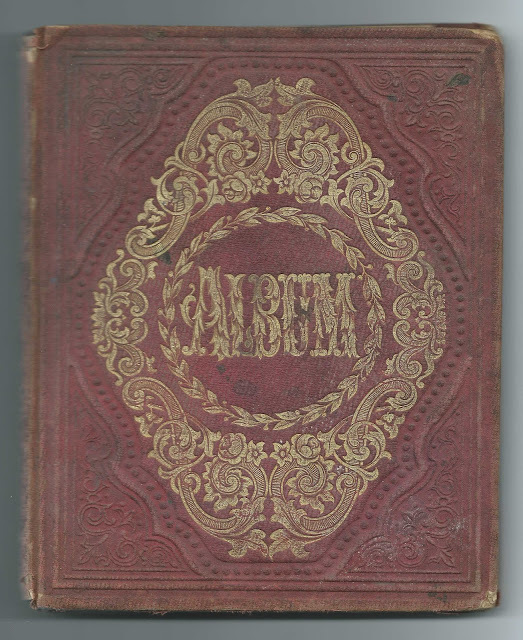 Presented the album to Angeline in 1854. "Presented to Miss Angeline Steele By her friend Renrut, 1854". Inscribed another page at Elizabethtown, Illinois, in 1854, and another undated page. Initials might be J. B. or I. B. or ? B.
Edna A. Twitchell, inscribed at Elizabethtown, Illinois, on January 2, 1907; Angeline's granddaughter. 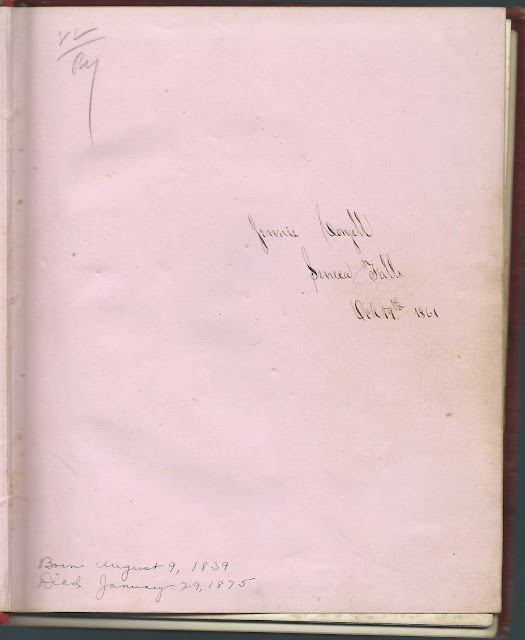 Harriet Angeline Steele, album owner, who went by Angeline or "Ange"; married Lafayette F. Twitchell about 1856 and kept on collecting autographs up to 1907. Bible of Rev. Daniel Warren and Sarah A. Warren, who were married at Guilford, Maine, in 1842 and raised their family at Bangor, Maine. Read more about Rev. Daniel Warren, who joined the Grace Church at Bangor, Maine, in 1832, in a publication of the East Maine Conference of the Methodist Episcopal Church. The Bible, which was printed in 1850 by S. Andrus and Son of Hartford, Connecticut, measures approximately 11-1/2" by 9-1/2" by 2-1/2". 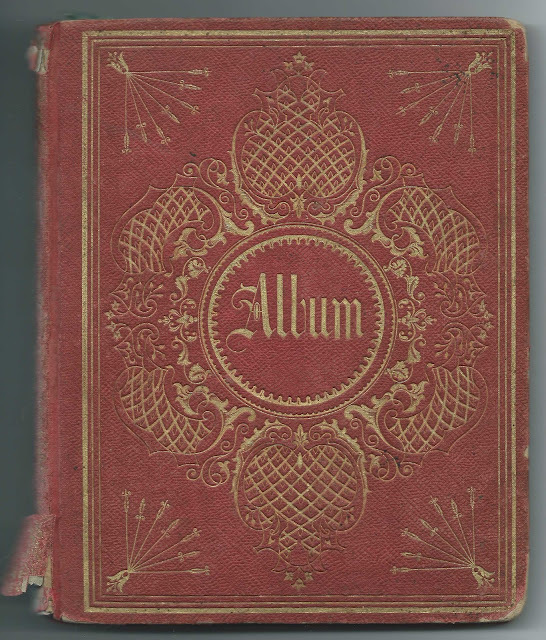 The covers and spine are vibrant and may have been restored or replaced. Sadly, the Bible came into contact with water at some point, but the damage is limited to staining. They were married in Guilford, Maine, on November 28, 1842, by Rev. L. P. French. Note: Rev. Luther P. French later served as chaplain of the 20th Maine Volunteer Infantry Regiment, which won acclaim at the Battle of Gettysburg in 1863. Miss Lilla F. Atkins, wife of Charles O. Warren; died in Bangor, Maine, on January 13, 1922, aged 63 years, 6 months. If you have information on the Warren, Sawyer and Atkins families, please leave a comment or contact me directly. 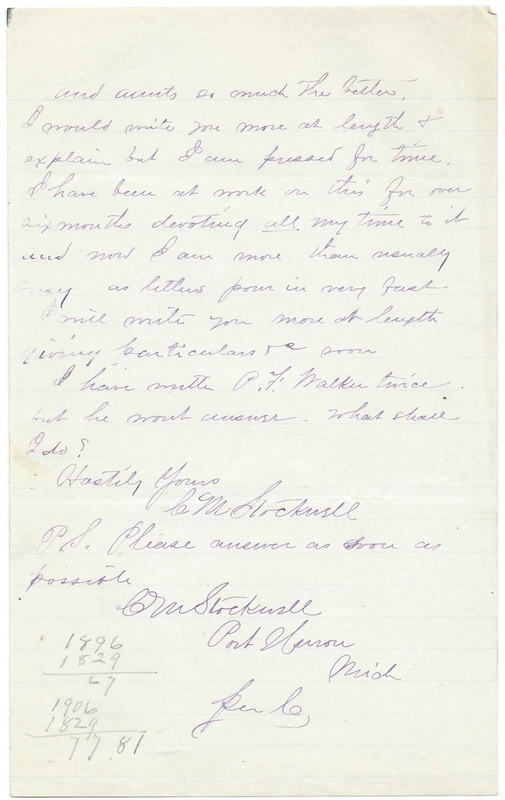 March 4, 1876 letter from C. M. Stockwell of Port Huron, Michigan, presumably Dr. Cyrus M. Stockwell, to a male Stockwell relative, asking for information about the relative's branch of the Stockwell family. Transcription at the end of this post. Click on any image to enlarge it. The letter was found in a Bible started by Joel Stockwell and wife Mary (Bailey) Stockwell of Vermont and Portage, New York. 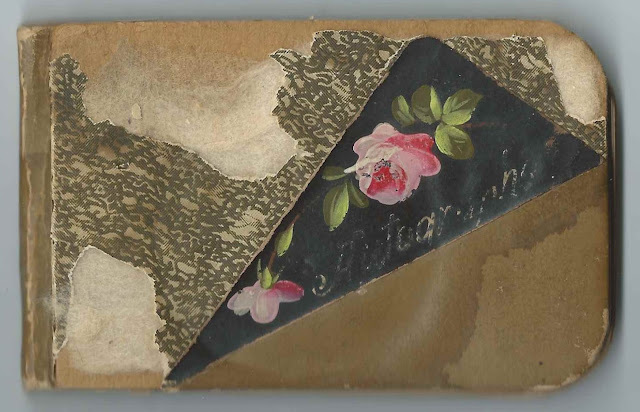 Sadly, the only envelope found with the letter is blank; it's possible, however, from clues in the letter and entries in the Bible that the recipient was Judson A. Stockwell (1833-1907) of Hume, New York. The letter is addressed to "Dear Sir". Mention is made of sister Olive. 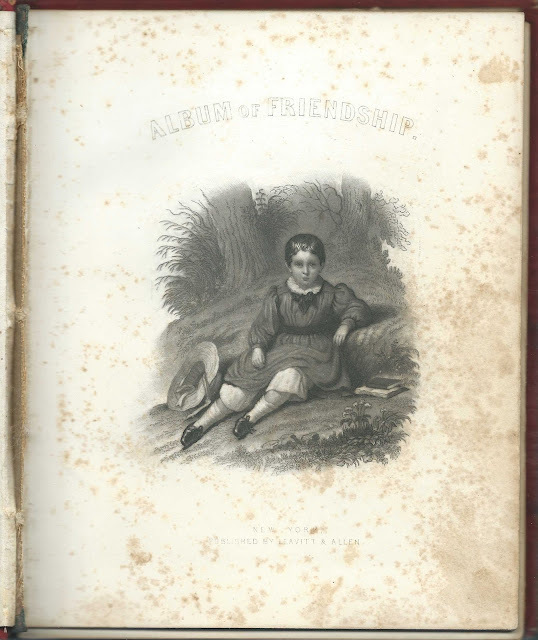 Judson had three sisters, including a sister named Olive, and no brothers. The author was looking for information to complete his work on the genealogy of the Stockwell family. This may have been privately published, as I haven't found anything mentioned online. 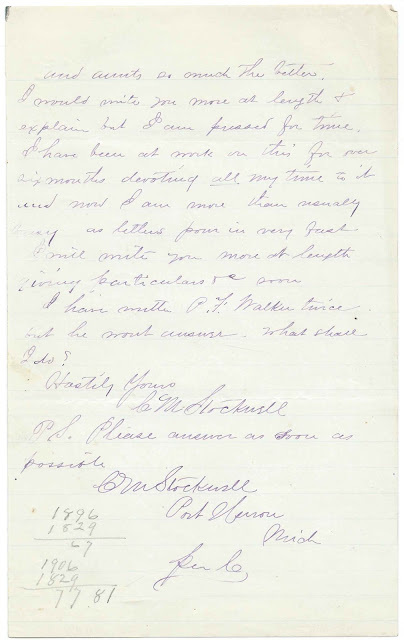 If you have a theory as to the identity of the recipient, especially if different from Judson A. Stockwell, please leave a comment or contact me directly. 2. Is she dead? If so, when did she die. 7. Names & addresses of any cousins who can give me further information. I have written the parties you named but can hear nothing from them. The work is nearly completed. Your branch is the only one that I am lacking entirely (except what you gave me). I go to Mass in a few weeks for the purpose of arranging for publication and also to search records to perfect the work. Mr. Henry Stockwell [or W. Henry Stockwell] is my uncle. If you can give me your great grandfather's name it will furnish me a link by which I can tell where you belong & if you can give names of great uncles and aunts so much the better. I would write you more at length & explain but I am pressed for time. I have been at work on this for over six months devoting all my time to it and now I am more than usually busy as letters pour in very fast. I will write you more at length giving particulars etc soon. I have written P. F. Walker twice but he won't answer. What shall I do? P.S. Please answer as soon possible.